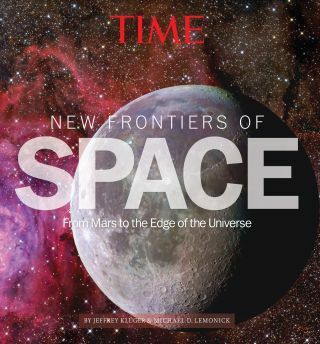 The cover of Time's "New Frontiers of Space: From Mars to the Edge of the Universe." A new book celebrates the past and future of human exploration of the cosmos. "New Frontiers of Space: From Mars to the Edge of the Universe" explores the most important people and breakthroughs in space science and spaceflight today. The team at TIME Books responsible for creating the coffee table book pulled their ideas directly from the headlines. "You also have new breakthroughs in commercial space in terms of SpaceX docking with the International Space Station, kind of an international growth in space exploration," said Steve Koepp, the editor of "New Frontiers of Space." "So, all these things were converging and it seemed like it provided material for going after this topic in a way that had many themes." The South African Large Telescope takes snapshots of the sky that allow scientists to study binary star systems. Image uploaded on July 25, 2013. The book features everything from a timeline of manned and unmanned missions to space to a section devoted to the major players on commercial spaceflight. Photos of the Earth from orbit, life on Mars and an African telescope are also explored in detail. The writers of the book — who included Jeffrey Kluger and Michael Lemonick — also highlighted some of the major unsolved mysteries of the universe. Kluger and Lemonick wrote about the hunt for extraterrestrial life and dark matter in the cosmos among other subjects. "There was such a variety in the topics that it seemed to lend itself to this broad approach with many different chapters," Koepp told SPACE.com. "It seems like rarely have we had this many breakthroughs and this many fascinating events regarding space all at one time." The team working on the book continued to update it until the oversized book went to print, Koepp said. A section about searching the skies for asteroids was updated continuously, while new discoveries from Curiosity were added as they happened. "New Frontiers in Space" also names the top 25 most influential people in space as chosen by a core group of editors and reporters. The list includes exoplanet scientists, private entrepreneurs and scientists from countries around the world. "Some are probably obvious, practically household names — people like [astrophysicist] Brian Green," Koepp said. "But we were going for diversity here: Diversity of academic pursuit, of business, global diversity, gender diversity. We wanted to show just how many different ways you can approach the frontiers of space."